In addition to being an HTTP proxy, Apache Traffic Server™ is also an HTTP cache. Traffic Server can cache any octet stream, although it currently supports only those octet streams delivered by the HTTP protocol. When such a stream is cached (along with the HTTP protocol headers) it is termed an object in the cache. Each object is identified by a globally unique value called a cache key. The purpose of this document is to describe the basic structure and implementation details of the Traffic Server cache. Configuration of the cache will be discussed only to the extent needed to understand the internal mechanisms. This document will be useful primarily to Traffic Server developers working on the Traffic Server codebase or plugins for Traffic Server. It is assumed the reader is already familiar with the Administrator’s Guide and specifically with HTTP Proxy Caching and Proxy Cache Configuration along with the associated configuration files. Unfortunately, the internal terminology is not particularly consistent, so this document will frequently use terms in different ways than they are used in the code in an attempt to create some consistency. The following sections describe how persistent cache data is structured. Traffic Server treats its persisent storage as an undifferentiated collection of bytes, assuming no other structure to it. In particular, it does not use the file system of the host operating system. If a file is used it is used only to mark out the set of bytes to be used. The raw storage for the Traffic Server cache is configured in storage.config. Each line in the file defines a cache span which is treated as a uniform persistent store. This storage organized into a set of administrative units which are called cache volumes. These are defined in volume.config. Cache volumes can be assigned different properties in hosting.config. Cache volumes can be defined by a percentage of the total storage or as an absolute amount of storage. By default, each cache volume is spread across all of the cache spans for robustness. 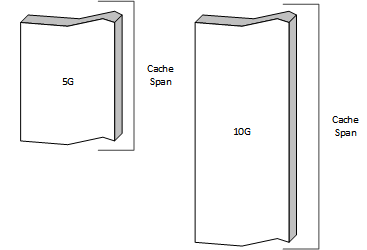 The intersection of a cache volume and a cache span is a cache stripe. Each cache span is divided into cache stripes and each cache volume is a collection of those stripes. Every cache stripe is in a single cache span and part of a single cache volume. Cache stripes are the fundamental unit of cache for the implementation. A cached object is stored entirely in a single stripe, and therefore in a single cache span. 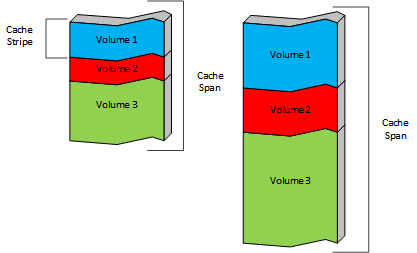 Objects are never split across cache spans or volumes. Objects are assigned to a stripe (and in turn to a cache volume) automatically based on a hash of the URI used to retrieve the object from the origin server. It is possible to configure this to a limited extent in hosting.config, which supports content from specific hosts or domain to be stored on specific cache volumes. As of version 4.0.1 it is also possible to control which cache spans (and hence, which cache stripes) are contained in a specific cache volume. 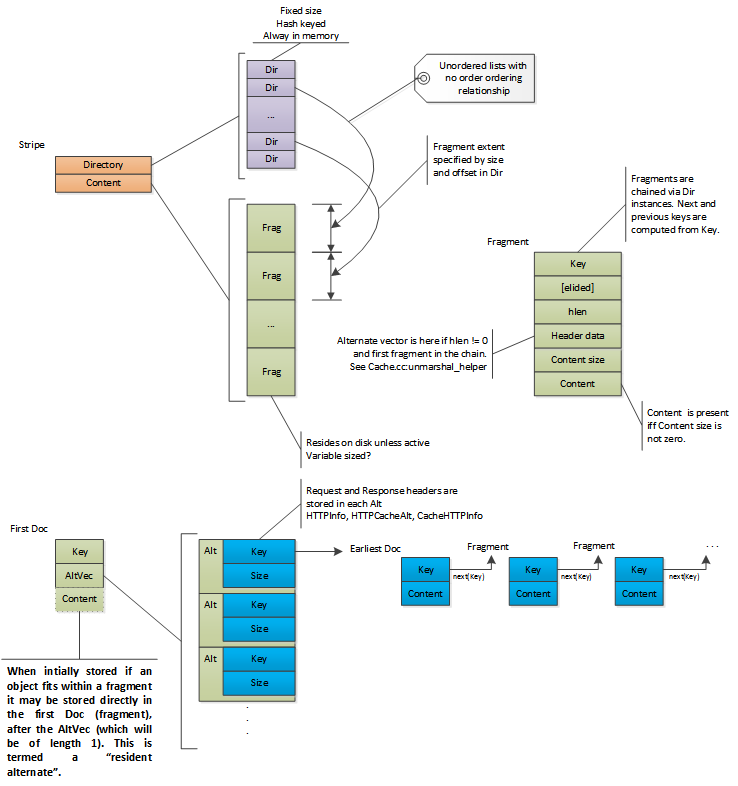 The layout and structure of the cache spans, the cache volumes, and the cache stripes that compose them are derived entirely from storage.config and cache.config and is recomputed from scratch when the traffic_server is started. Therefore, any change to those files can (and almost always will) invalidate the existing cache in its entirety. Each cache span is marked at the front with a span header of type DiskHeader. Each span is divided in to span blocks. These can be thought of similarly to normal disk partitions, marking out blocks of storage. Span blocks can v ary in size, subject only to being a multiple of the volume block size which is currently 128MB and, of course, being no larger than the span. The relationship between a span block and a cache stripe is the same as between a disk partition and a file system. A cache stripe is structured data contained in a span block and always occupies the entire span block. Traffic Server treats the storage associated with a cache stripe as an undifferentiated span of bytes. Internally each stripe is treated almost entirely independently. The data structures described in this section are duplicated for each stripe. Internally the term volume is used for these stripes and implemented primarily in Vol. What a user thinks of as a volume (and what this document calls a cache volume) is represented by CacheVol. Stripe assignment must be done before working with an object because the directory is local to the stripe. Any cached objects for which the stripe assignment is changed are effectively lost as their directory data will not be found in the new stripe. Content in a stripe is tracked via a directory. Each element of the directory is a directory entry and is represented by Dir. Each entry refers to a chunk of contiguous storage in the cache. These are referred to variously as fragments, segments, docs, documents, and a few other things. This document will use the term fragment as that is the most common reference in the code. The term Doc (for Doc) will be used to refer to the header data for a fragment. Overall, the directory is treated as a hash with the cache ID as the key. See directory probing for how the cache ID is used to locate a directory entry. The cache ID is in turn computed from a cache key which by default is the URL of the content. The directory is used as a memory resident structure, which means a directory entry is as small as possible (currently 10 bytes). This forces some compromises on the data that can be stored there. On the other hand this means that most cache misses do not require disk I/O, which has a large performance benefit. The directory is always fully sized; once a stripe is initialized the directory size is fixed and never changed. This size is related (roughly linearly) to the size of the stripe. It is for this reason the memory footprint of Traffic Server depends strongly on the size of the disk cache. Because the directory size does not change, neither does this memory requirement, so Traffic Server does not consume more memory as more content is stored in the cache. If there is enough memory to run Traffic Server with an empty cache there is enough to run it with a full cache. Each entry stores an offset in the stripe and a size. The size stored in the directory entry is an approximate size which is at least as big as the actual data in the fragment. Exact size data is stored in the fragment header on disk. Data in HTTP headers cannot be examined without disk I/O. This includes the original URL for the object. The cache key is not stored explicitly and therefore cannot be reliably retrieved. The directory is a hash table that uses chaining for collision resolution. Because each entry is small they are used directly as the list header of the hash bucket. Chaining is implemented by imposing grouping structures on the entries in a directory. The first level grouping is a directory bucket. This is a fixed number (currently 4, defined as DIR_DEPTH) of entries. 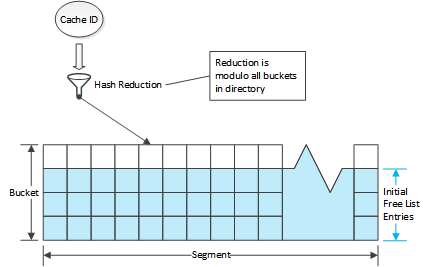 This serves to define the basic hash buckets with the first entry in each cache bucket serving as the root of the hash bucket. The term bucket is used in the code to mean both the conceptual bucket for hashing and for a structural grouping mechanism in the directory. These will be qualified as needed to distinguish them. The unqualified term bucket is almost always used to mean the structural grouping in the directory. Directory buckets are grouped in to segments. All segments in a stripe have the same number of buckets. The number of segments in a stripe is chosen so that each segment has as many buckets as possible without exceeding 65,535 (216-1) entries in a segment. Each directory entry has a previous and next index value which is used to link entries in the same segment. Because no segment has more than 65,535 entries, 16 bits suffices for storing the index values. The stripe header contains an array of entry indices which are used as the roots of entry free lists, one for each segment. Active entries are stored via the bucket structure. When a stripe is initialized the first entry in each bucket is zeroed (marked unused) and all other entries are put in the corresponding segment free list in the stripe header. This means the first entry of each directory bucket is used as the root of a hash bucket and is therefore marked unused rather than being put a free list. The other entries in the directory bucket are preferred for adding to the corresponding hash bucket but this is not required. The segment free lists are initialized such that the extra bucket entries are added in order; all the seconds, then the thirds, then the fourths. Because the free lists are FIFOs, this means extra entries will be selected from the fourth entries across all the buckets first, then the thirds, etc. When allocating a new directory entry in a bucket the entries are searched from first to last, which maximizes bucket locality (that is, cache IDs that map to the same hash bucket will also tend to use the same directory bucket). Entries are removed from the free list when used and returned when no longer in use. When a fragment needs to be put in to the directory the cache ID is used to locate a hash bucket (which also determines the segment and directory bucket). If the first entry in the directory bucket is marked unused, it is used. Otherwise, the other entries in the bucket are searched and if any are on the free list, that entry is used. If none are available then the first entry on the segment free list is used. This entry is attached to the hash bucket via the same next and previous indices used for the free list so that it can be found when doing a lookup of a cache ID. The storage layout is the stripe metadata followed by cached content. The metadata consists of three parts: the stripe header, the directory, and the stripe footer. The metadata is stored twice. 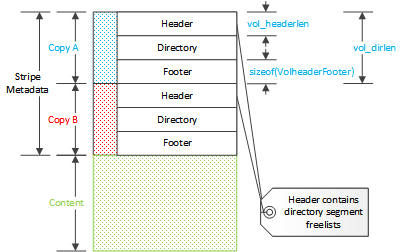 The header and the footer are instances of VolHeaderFooter. This is a stub structure which can have a trailing variable sized array. This array is used as the segment free list roots in the directory. Each contains the segment index of the first element of the free list for the segment. The footer is a copy of the header without the segment free lists. This makes the size of the header dependent on the directory but not that of the footer. The start of stripe data. This represents either space reserved at the start of a physical device to avoid problems with the host operating system, or an offset representing use of space in the cache span by other stripes. The offset for the start of the content, after the stripe metadata. Total number of bytes in the stripe. Vol::len. Total number of blocks in the stripe available for content storage. Vol::data_blocks. Great care must be taken with sizes and lengths in the cache code because there are at least three different metrics (bytes, cache blocks, store blocks) used in various places. The header for a stripe is a variably sized instance of VolHeaderFooter. The variable trailing section contains the head indices of the directory entry free lists for the segments. The trailing VolHeaderFooter::freelist array overlays the disk storage with an entry for every segment, even though the array is declared to have length 1 . Each free list entry is a 16 bit value that is the index of the first directory entry in the free list for that segment. E.g. freelist is the index of the directory entry in segment 4 that is the first directory entry in the free list for segment 4 . The rest of the free list is chained from that directory entry. The segment freelist is attached only to the header - the trailer, although of the same class, does not have a freelist and is always a fixed size. The total size of the directory (the number of entries) is computed by taking the size of the cache stripe and dividing by the average object size. The directory always consumes this amount of memory which has the effect that if cache size is increased so is the memory requirement for Traffic Server. The average object size defaults to 8000 bytes but can be configured using proxy.config.cache.min_average_object_size. Increasing the average object size will reduce the memory footprint of the directory at the expense of reducing the number of distinct objects that can be stored in the cache. The content area stores the actual objects and is used as a circular buffer where new objects overwrite the least recently cached objects. The location in a stripe where new cache data is written is called the write cursor. This means that objects can be de facto evicted from cache even if they have not expired if the data is overwritten by the write cursor. If an object is overwritten this is not detected at that time and the directory is not updated. Instead it will be noted if the object is accessed in the future and the disk read of the fragment fails. Cache data on disk is never updated. This is a key thing to keep in mind. What appear to be updates (such as doing a refresh on stale content and getting back a 304) are actually new copies of data being written at the write cursor. The originals are left as “dead” space which will be consumed when the write cursor arrives at that disk location. Once the stripe directory is updated (in memory) the original fragment in the cache is effectively destroyed. This is the general space management technique used in other cases as well. If an object needs to removed from cache, only the directory needs to be changed. No other work (and particularly, no disk I/O) needs to be done. Objects are stored as two types of data: metadata and content data. Metadata is all the data about the object and the content and includes the HTTP headers. The content data is the content of the object, the octet stream delivered to the client as the object. Objects are rooted in a Doc structure stored in the cache. Doc serves as the header data for a cache fragment and is contained at the start of every fragment. The first fragment for an object is termed the First Doc and always contains the object metadata. Any operation on the object will read this fragment first. The fragment is located by converting the cache key for the object to a cache ID and then doing a lookup for a directory entry with that key. The directory entry has the offset and approximate size of the first fragment which is then read from the disk. This fragment will contain the request header and response along with overall object properties (such as content length). Traffic Server supports varying content for objects. These are called alternates. All metadata for all alternates is stored in the first fragment including the set of alternates and the HTTP headers for them. This enables alternate selection to be done after the first Doc is read from disk. An object that has more than one alternate will have the alternate content stored separately from the first fragment. For objects with only one alternate the content may or may not be in the same (first) fragment as the metadata. Each separate alternate content is allocated a directory entry and the key for that entry is stored in the first fragment metadata. Prior to version 4.0.1, the header data was stored in the CacheHTTPInfoVector class which was marshaled to a variable length area of the on disk image, followed by information about additional fragments if needed to store the object. This had the problem that with only one fragment table it could not be reliable for objects with more than one alternate[#multiple-alternates]_. Therefore, the fragment data was moved from being a separate variable length section of the metadata to being directly incorporated in to the CacheHTTPInfoVector, yielding a layout of the following form. 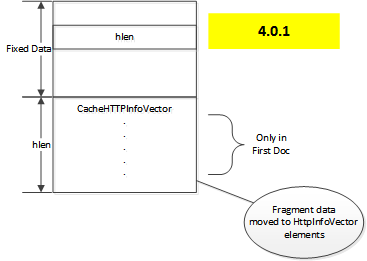 Each element in the vector contains for each alternate, in addition to the HTTP headers and the fragment table (if any), a cache key. This cache key identifies a directory entry that is referred to as the earliest Doc. This is the location where the content for the alternate begins. When the object is first cached, it will have a single alternate and that will be stored (if not too large) in first Doc. This is termed a resident alternate in the code. This can only happen on the initial store of the object. If the metadata is updated (such as a 304 response to an If-Modified-Since request) then unless the object is small, the object data will be left in the original fragment and a new fragment written as the first fragment, making the alternate non-resident. Small is defined as a length smaller than proxy.config.cache.alt_rewrite_max_size. The CacheHTTPInfoVector is stored only in the first Doc. Subsequent Doc instances for the object, including the earliest Doc, should have an hlen of zero and if not, it is ignored. Where next_key is a global function that deterministically computes a new cache key from an existing cache key. Objects with multiple fragments are laid out such that the data fragments (including the earliest Doc) are written first and the first Doc is written last. When read from disk, both the first and earliest Doc are validated (tested to ensure that they haven’t been overwritten by the write cursor) to verify that the entire document is present on disk (as they bookend the other fragments - the write cursor cannot overwrite them without overwriting at least one of the verified Doc instances). Note that while the fragments of a single object are ordered they are not necessarily contiguous, as data from different objects are interleaved as the data arrives in Traffic Server. Documents which are pinned into the cache must not be overwritten so they are evacuated from in front of the write cursor. Each fragment is read and rewritten. There is a special lookup mechanism for objects that are being evacuated so that they can be found in memory rather than the potentially unreliable disk regions. The cache scans ahead of the write cursor to discover pinned objects as there is a dead zone immediately before the write cursor from which data cannot be evacuated. Evacuated data is read from disk and placed in the write queue and written as its turn comes up. Objects can only be pinned via cache.config and while proxy.config.cache.permit.pinning is set to non-zero (it is zero by default). Objects which are in use when the write cursor is near use the same underlying evacuation mechanism but are handled automatically and not via the explicit pinned bit in Dir. Some general observations on the data structures. Because the cache is a cyclone cache, objects are not preserved for an indefinite time. Even if the object is not stale it can be overwritten as the cache cycles through its volume. Marking an object as pinned preserves the object through the passage of the write cursor but this is done by copying the object across the gap, in effect re-storing it in the cache. Pinning large objects or a large number objects can lead to excessive disk activity. The original purpose of pinning was for small, frequently used objects explicitly marked by the administrator. This means the purpose of expiration data on objects is simply to prevent them from being served to clients. They are not in the standard sense deleted or cleaned up. The space can’t be immediately reclaimed in any event, because writing only happens at the write cursor. Deleting an object consists only of removing the directory entries in the volume directory which suffices to (eventually) free the space and render the document inaccessible. Historically, the cache was designed this way because web content was relatively small and not particularly consistent. The design also provided high performance and low consistency requirements. There are no fragmentation issues for the storage, and both cache misses and object deletions require no disk I/O. It does not deal particularly well with long term storage of large objects. See the Volume Tagging appendix for details on some work in this area. Restoring a disk to active duty is a more difficult task. Changing the volume assignment of a cache key renders any currently cached data inaccessible. This is not a problem when a disk has failed, but is a bit trickier to decide which cached objects are to be de facto evicted if a new storage unit is added to a running system. The mechanism for this, if any, is still under investigation. The in memory volume directory entries are described below. next unsigned int:16 Segment local index of next entry. The stripe directory is an array of Dir instances. Each entry refers to a span in the volume which contains a cached object. Because every object in the cache has at least one directory entry this data has been made as small as possible. The offset value is the starting byte of the object in the volume. It is 40 bits long, split between the offset (lower 24 bits) and offset_high (upper 16 bits) members. Note that since there is a directory for every storage unit in a cache volume, this is the offset in to the slice of a storage unit attached to that volume. The size and big values are used to calculate the approximate size of the fragment which contains the object. This value is used as the number of bytes to read from storage at the offset value. The exact size is contained in the object metadata in Doc which is consulted once the read has completed. For this reason, the approximate size needs to be at least as large as the actual size but can be larger, at the cost of reading the extraneous bytes. Note also that size is effectively offset by one, so a value of 0 indicates a single unit of the multiplier. The target fragment size can set with the records.config value proxy.config.cache.target_fragment_size. This value should be chosen so that it is a multiple of a cache entry multiplier. It is not necessary to make it a power of two . Larger fragments increase I/O efficiency but lead to more wasted space. The default size (1M, 2^20) is a reasonable choice in most circumstances, altough in very specific cases there can be benefit from tuning this parameter. Traffic Server imposes an internal maximum of a 4,194,232 bytes, which is 4M (2^22), less the size of a struct Doc. In practice, the largest reasonable target fragment size is 4M - 262,144 = 3,932,160. When a fragment is stored to disk, the size data in the cache index entry is set to the finest granularity permitted by the size of the fragment. To determine this, consult the cache entry multipler table and find the smallest maximum size that is at least as large as the fragment. That will indicate the value of big selected and therefore the granularity of the approximate size. That represents the largest possible amount of wasted disk I/O when the fragment is read from disk. The set of index entries for a volume are grouped in to segments. The number of segments for an index is selected so that there are as few segments as possible such that no segment has more than 2^16 entries. Intra-segment references can therefore use a 16 bit value to refer to any other entry in the segment. Index entries in a segment are grouped buckets, each of DIR_DEPTH (currently 4) entries. These are handled in the standard hash table manner, giving somewhat less than 2^14 buckets per segment. Directory probing is the locating of a specific directory entry in the stripe directory based on a cache ID. This is handled primarily by the function dir_probe(). This is passed the cache ID (key), a stripe (d), and a last collision (last_collision). The last of these is an in and out parameter, updated as useful during the probe. Given an ID, the top half (64 bits) is used as a segment index, taken modulo the number of segments in the directory. The bottom half is used as a bucket index, taken modulo the number of buckets per segment. The last_collision value is used to mark the last matching entry returned by dir_probe(). After computing the appropriate bucket, the entries in that bucket are searched to find a match. In this case a match is detected by comparison of the bottom 12 bits of the cache ID (the cache tag). The search starts at the base entry for the bucket and then proceeds via the linked list of entries from that first entry. If a tag match is found and there is no collision then that entry is returned and last_collision is updated to that entry. If collision is set and if it isn’t the current match, the search continues down the linked list, otherwise collision is cleared and the search continues. The effect of this is that matches are skipped until the last returned match (last_collision) is found, after which the next match (if any) is returned. If the search falls off the end of the linked list, then a miss result is returned (if no last collision), otherwise the probe is restarted after clearing the collision on the presumption that the entry for the collision has been removed from the bucket. This can lead to repeats among the returned values but guarantees that no valid entry will be skipped. Last collision can therefore be used to restart a probe at a later time. This is important because the match returned may not be the actual object. Although the hashing of the cache ID to a bucket and the tag matching is unlikely to create false positives, it is possible. 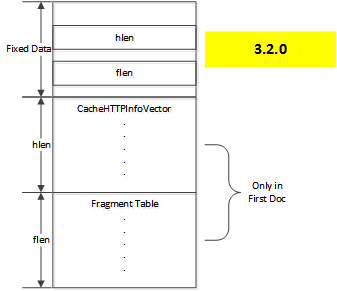 When a fragment is read the full cache ID is available and checked and if wrong, that read can be discarded and the next possible match from the directory found because the cache virtual connection tracks the last collision value. Cache activity starts after the HTTP request header has been parsed and remapped. Tunneled transactions do not interact with the cache because the headers are never parsed. To understand the logic we must introduce the term cache valid which means something that is directly related to an object that is valid to be put in the cache (e.g. a DELETE which refers to a URL that is cache valid but cannot be cached itself). This is important because Traffic Server computes cache validity several times during a transaction and only performs cache operations for cache valid results. The criteria used changes during the course of the transaction as well. This is done to avoid the cost of cache activity for objects that cannot be in the cache. The three basic cache operations are: lookup, read, and write. We will take deleting entries as a special case of writing where only the volume directory is updated. After the client request header is parsed and is determined to be potentially cacheable, a cache lookup is done. If successful, a cache read is attempted. If either the lookup or the read fails and the content is considered cacheable then a cache write is attempted. The first thing done with a request with respect to cache is to determine whether it is potentially a valid object for the cache. After initial parsing and remapping, this check is done primarily to detect a negative result, as it allows further cache processing to be skipped. It will not be put in to the cache, nor will a cache lookup be performed. There are a number of prerequisites along with configuration options to change them. Additional cacheability checks are done later in the process, when more is known about the transaction (such as plugin operations and the origin server response). Those checks are described as appropriate in the sections on the relevant operations. The initial internal checks, along with their records.config overrides[#cacheability-overrides]_, are done in HttpTransact::is_request_cache_lookupable. The request must be one of GET, HEAD, POST, DELETE, PUT. Has cgi in the path. This check can be disabled by setting a non-zero value for proxy.config.http.cache.cache_urls_that_look_dynamic. In addition if a TTL is set for rule that matches in cache.config then this check is not done. Cache valid only if proxy.config.http.cache.range.lookup in records.config is non-zero. This does not mean the range request can be cached, only that it might be satisfiable from the cache. In addition, proxy.config.http.cache.range.write can be set to try to force a write on a range request. This probably has little value at the moment, but if for example the origin server ignores the Range: header, this option can allow for the response to be cached. It is disabled by default, for best performance. A plugin can call TSHttpTxnReqCacheableSet() to force the request to be viewed as cache valid. If the initial request is not determined to be cache invalid then a lookup is done. Cache lookup determines if an object is in the cache and if so, where it is located. In some cases the lookup proceeds to read the first Doc from disk to verify the object is still present in the cache. The cache key is computed. This is normally computed using the request URL but it can be overridden by a plugin . The cache index string is not stored, as it is presumed computable from the client request headers. The cache stripe is determined (based on the cache key). The cache key is used as a hash key in to an array of Vol instances by Cache::key_to_vol(). The construction and arrangement of this array is the essence of how volumes are assigned. 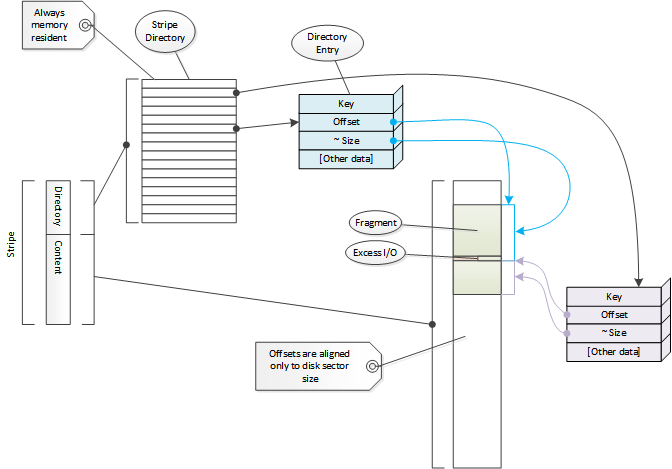 The cache stripe directory is probed using the index key computed from the cache key. Various other lookaside directories are checked as well, such as the aggregation buffer. If the directory entry is found the first Doc is read from disk and checked for validity. This is done in CacheVC::openReadStartHead() or CacheVC::openReadStartEarliest() which are tightly coupled methods. If the lookup succeeds, then a more detailed directory entry (struct OpenDir) is created. Note that the directory probe includes a check for an already extant OpenDir which, if found, is returned without additional work. Cache read starts after a successful cache lookup. At this point the first Doc has been loaded in to memory and can be consulted for additional information. This will always contain the HTTP headers for all alternates of the object. There is provision in the code to support read while write, that is, serving an object from cache in one transaction while it is being written in another. Several settings are needed for it to be used. See Reducing Origin Server Requests (Avoiding the Thundering Herd). It must specifically enabled in records.config and if not, a cache read will fail if the object is currently be written or updated. At this point an alternate for the object is selected. This is done by comparing the client request to the stored response headers, but it can be controlled by a plugin using TS_HTTP_ALT_SELECT_HOOK. The content can now be checked to see if it is stale by calculating the freshness of the object. This is essentially checking how old the object is by looking at the headers and possibly other metadata (note that the headers can’t be checked until we’ve selected an alternate). Most of this work is done in HttpTransact::what_is_document_freshness. First, the TTL (time to live) value, which can be set in cache.config, is checked if the request matches the configuration file line. This is done based on when the object was placed in the cache, not on any data in the headers. Next, an internal flag (needs-revalidate-once) is checked if the cache.config value revalidate-after is not set, and if set the object is marked stale. After these checks the object age is calculated by HttpTransactHeaders::calculate_document_age. and then any configured fuzzing is applied. The limits to this age based on available data is calculated by HttpTransact::calculate_document_freshness_limit. How this age is used is determined by the records.config setting for proxy.config.http.cache.when_to_revalidate. If this is 0 then the built calculations are used which compare the freshness limits with document age, modified by any of the client supplied cache control values (max-age, min-fresh, max-stale) unless explicitly overridden in cache.config. If the object is not stale then it is served to the client. If it is stale, the client request may be changed to an If Modified Since request to revalidate. The request is served using a standard virtual connection tunnel (HttpTunnel) with the CacheVC acting as the producer and the client NetVC acting as the sink. If the request is a range request this can be modified with a transform to select the appropriate parts of the object or, if the request contains a single range, it can use the range acceleration. Range acceleration is done by consulting a fragment offset table attached to the earliest Doc which contains offsets for all fragments past the first. This allows loading the fragment containing the first requested byte immediately rather than performing reads on the intermediate fragments. Writing to the cache is handled by an instance of the class CacheVC. This is a virtual connection which receives data and writes it to cache, acting as a sink. For a standard transaction data transfers between virtual connections (VConns) are handled by HttpTunnel. Writing to the cache is done by attaching a CacheVC instance as a tunnel consumer. It therefore operates in parallel with the virtual connection that transfers data to the client. The data does not flow to the cache and then to the client, it is split and goes both directions in parallel. This avoids any data synchronization issues between the two. The actual write to disk is handled in a separate thread dedicated to I/O operations, the AIO threads. The cache logic marshals the data and then hands the operation off to the AIO thread which signals back once the operation completes. While each CacheVC handles its transactions independently, they do interact at the volume level as each CacheVC makes calls to the volume object to write its data to the volume content. The CacheVC accumulates data internally until either the transaction is complete or the amount of data to write exceeds the target fragment size. In the former case the entire object is submitted to the volume to be written. In the latter case, a target fragment size amount of data is submitted and the CacheVC continues to operate on subsequent data. The volume in turn places these write requests in an holding area called the aggregation buffer. For objects under the target fragment size, there is no consideration of order, the object is simply written to the volume content. For larger objects, the earliest Doc is written first and the first Doc written last. This provides some detection ability should the object be overwritten. Because of the nature of the write cursor no fragment after the first fragment (in the earliest Doc) can be overwritten without also overwriting that first fragment (since we know at the time the object was finalized in the cache the write cursor was at the position of the first Doc). It is the responsibility of the CacheVC to not submit writes that exceed the target fragment size. A conditional request is made to the origin server and a 304 - Not Modified response is received. An alternate of the object is retrieved from an origin server and added to the object. An alternate of the object is removed (e.g., due to a DELETE request). In every case the metadata for the object must be modified. Because Traffic Server never updates data already in the cache this means the first Doc will be written to the cache again and the volume directory entry updated. Because a client request has already been processed the first Doc has been read from cache and is in memory. The alternate vector is updated as appropriate (an entry added or removed, or changed to contain the new HTTP headers), and then written to disk. It is possible for multiple alternates to be updated by different CacheVC instances at the same time. The only contention is the first Doc; the rest of the data for each alternate is completely independent. Disk writes to cache are handled through an aggregation buffer. There is one for each Vol instance. To minimize the number of system calls data is written to disk in units of roughly target fragment size bytes. The algorithm used is simple: data is piled up in the aggregation buffer until no more will fit without going over the target fragment size, at which point the buffer is written to disk and the volume directory entries for objects with data in the buffer are updated with the actual disk locations for those objects (which are determined by the write to disk action). After the buffer is written it is cleared and process repeats. There is a special lookup table for the aggregation buffer so that object lookup can find cache data in that memory. Because data in the aggregation buffer is visible to other parts of the cache, particularly cache lookup, there is no need to push a partially filled aggregation buffer to disk. In effect, any such data is memory cached until enough additional cache content arrives to fill the buffer. The target fragment size has little effect on small objects because the fragment size is used only to parcel out disk write operations. For larger objects the effect very significant as it causes those objects to be broken up in to fragments at different locations on in the volume. Each fragment write has its own entry in the volume directory which are computationally chained (each cache key is computed from the previous one). If possible, a fragment table is accumulated in the earliest Doc which has the offsets of the first byte for each fragment. By default, the write cursor will overwrite (de facto evict from cache) objects as it proceeds once it has gone around the cache stripe at least once. In some cases this is not acceptable and the object is evacuated by reading it from the cache and then writing it back to cache which moves the physical storage of the object from in front of the write cursor to behind the write cursor. Objects that are evacuated are handled in this way based on data in stripe data structures (attached to the Vol instance). Evacuation data structures are defined by dividing up the volume content into a disjoint and contiguous set of regions of EVACUATION_BUCKET_SIZE bytes. The Vol::evacuate member is an array with an element for each evacuation region. Each element is a doubly linked list of EvacuationBlock instances. Each instance contains a Dir that specifies the fragment to evacuate. It is assumed that an evacuation block is placed in the evacuation bucket (array element) that corresponds to the evacuation region in which the fragment is located although no ordering per bucket is enforced in the linked list (this sorting is handled during evacuation). Objects are evacuated by specifying the first or earliest fragment in the evactuation block. The evactuation operation will then continue the evacuation for subsequent fragments in the object by adding those fragments in evacuation blocks. Note that the actual evacuation of those fragments is delayed until the write cursor reaches the fragments, it is not necessarily done at the time the earliest fragment is evacuated. There are two types of evacuations: reader based and forced. The EvacuationBlock has a reader count to track this. If the reader count is zero, then it is a forced evacuation and the the target, if it exists, will be evacuated when the write cursor gets close. If the reader value is non-zero then it is a count of entities that are currently expecting to be able to read the object. Readers increment the count when they require read access to the object, or create the EvacuationBlock with a count of 1. When a reader is finished with the object it decrements the count and removes the EvacuationBlock if the count goes to zero. If the EvacuationBlock already exists with a count of zero, the count is not modified and the number of readers is not tracked, so the evacuation is valid as long as the object exists. Evacuation is driven by cache writes, essentially in Vol::aggWrite. This method processes the pending cache virtual connections that are trying to write to the stripe. Some of these may be evacuation virtual connections. If so then the completion callback for that virtual connection is called as the data is put in to the aggregation buffer. When no more cache virtual connections can be processed (due to an empty queue or the aggregation buffer filling) then Vol::evac_range is called to clear the range to be overwritten plus an additional EVACUATION_SIZE range. The buckets covering that range are checked. If there are any items in the buckets a new cache virtual connection (a doc evacuator) is created and used to read the evacuation item closest to the write cursor (i.e. with the smallest offset in the stripe) instead of the aggregation write proceeding. When the read completes it is checked for validity and if valid, the cache virtual connection for it is placed at the front of the write queue for the stripe and the write aggregation resumed. Before doing a write, the method Vol::evac_range() is called to start an evacuation. If any fragments are found in the buckets in the range the earliest such fragment (smallest offset, closest to the write cursor) is selected and read from disk and the aggregation buffer write is suspended. The read is done via a cache virtual connection which also effectively serves as the read buffer. Once the read is complete, that cache virtual connection instance (the doc evacuator) is placed at the front of the stripe write queue and written out in turn. Because the fragment data is now in memory it is acceptable to overwrite the disk image. Note that when normal stripe writing is resumed, this same check is done again, each time evauating (if needed) a fragment and queuing them for writing in turn. Updates to the directory are done when the write for the evacuated fragment completes. Multi-fragment objects are detected after the read completes for a fragment. If it is not the first fragment then the next fragment is marked for evacuation (which in turn, when it is read, will pull the subsequent fragment). The logic presumes that the end of the alternate is when the next key is not in the directory. This interacts with the one at a time strategy of the aggregation write logic. If a fragment is close to the fragment being evacuated, it may end up in the same evacuation bucket. Because the aggregation write checks every time for the next fragment to evacuate it will find that next fragment and evacuate it before it is overwritten. The primary source of fragments to be evacuated are active fragments. That is, fragments which are currently open for reading or writing. This is tracked by the reader value in the evacuation blocks noted above. If object pinning is enabled, then a scan is done on a regular basis as the write cursor moves to detect pinned objects and mark them for evacuation. Fragments can also be evacuated through hit evacuation. This is configured by proxy.config.cache.hit_evacuate_percent and proxy.config.cache.hit_evacuate_size_limit. When a fragment is read it is checked to see if it is close and in front of the write cursor, close being less than the specified percent of the size of the stripe. If set at the default value of 10, then if the fragment is withing 10% of the size of the stripe, it is marked for evacuation. This is cleared if the write cursor passes through the fragment while it remains open (as all open objects are evacuated). If, when the object is closed, the fragment is still marked then it is placed in the appropriate evacuation bucket. It could, under certain circumstances, be accurate for none of the alternates. The comment in earlier versions of the records.config documentation which indicated that this value must be a power of two were, unfortunately, mistaken and have been corrected. The code appears to check cache.config in this logic by setting the does_config_permit_lookup in the cache_info.directives of the state machine instance but I can find no place where the value is used. The directive does_config_permit_storing is set and later checked so the directive (from the administrator point of view) is effective in preventing caching of the object.